This meal was actually one we ate back in January, but considering the way our January turned out to be, I never got around to posting it. Our New Year’s dinner was braised brisket, a pretty basic one with aromatic vegetables, rosemary, red wine, and tomato. On a whim, I decided to divide the brisket in half first, and use part of it to try my hand at making corned beef. Essentially, a corned beef is just a piece of brisket that has been brined in salt, sugar, and pickling spices for 10 days; then you either boil or roast it until meltingly tender, or rub it with more spices and smoke it if you want to call it pastrami. You may have noticed that I am a new fermentation convert: Sauerkraut, lacto-fermented dill-garlic pickles, preserved lemons, homemade apple cider vinegar, and salt-cured wild salmon gravlax have all found their way into our menu regularly in the past 9 months. So it was about time I took a peek into the world of pickled meats! I admit I was a little worried about corning beef myself. Most recipes call for saltpetre, or potassium nitrite, a chemical preservative that allows the beef to keep its red color (and also makes guns go “boom”). 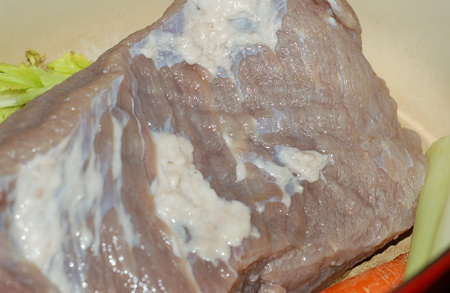 Fortunately, most recipes do consider it to be an optional cosmetic, and since nitrates have been connected to various health concerns in recent years, most prominently cancer, I opted to go without for my little experiment. After ten days of luxuriating in its fragrant bath, it was time to confront the beef. 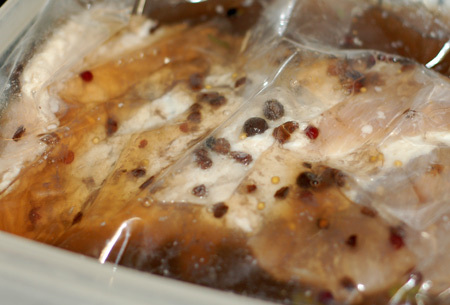 I was honestly half-afraid to be met with the scent of rotting meat when I opened the Ziploc bag, but even holding the brisket right under my nose, all I could smell was spices: juniper, allspice, cloves, bay, mustard, cinnamon, ginger, and pink peppercorns. The meat itself was an admittedly unappealing shade of grayish pink, with a softened texture that I am finding hard to describe. Giving it a quick rinse, I moved it to a fresh bath of plain boiling water, along with chunks of celery, carrot and onion. 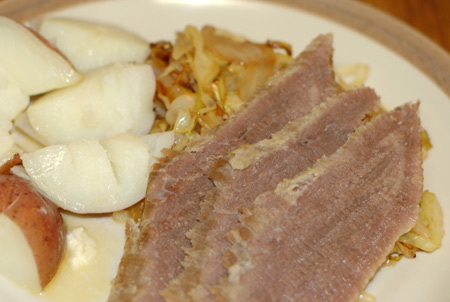 When the beef was nearly ready to eat, I added some little red potatoes to the pot, and sauted some cabbage and onions to go along with it. Then I sliced it thin, crossed my fingers, and took a bite. Sources: Improvised from Bon Appetit, jun-blog, and Simply Recipes. 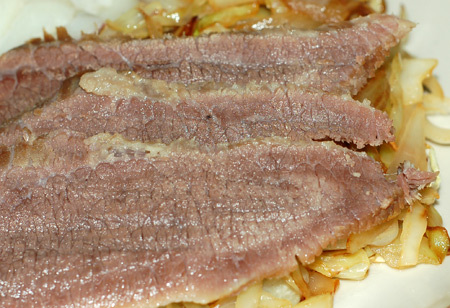 Wow nicely done I have never tried to make my own corn beef well done indeed….